Saving money continues to be a challenge for Americans. That’s the finding of GOBankingRates’ most recent savings survey. Since 2015, GOBankingRates has asked Americans how much they have in savings. Each year, the survey results have shown that a majority of adults don’t even have $1,000 in a savings account. That trend continues in 2018. To find out why this year’s survey also asked respondents what obstacles are preventing them from saving and what they’d be willing to sacrifice to reach their savings goals. For those who are setting aside cash, the poll sought to find out what they are saving for and what resources have helped them manage their savings. The survey found that 58 percent of respondents had less than $1,000 saved. “It’s always concerning when a large part of the population is seemingly living paycheck to paycheck because when unexpected personal or financial hardships occur, it can be challenging to recover without adequate savings,” Jason Thacker, head of consumer deposits and payments at TD Bank, said. For the most part, there was very little improvement from last year’s survey. In fact, the percentage of adults with less than $1,000 in savings increased slightly to 58 percent from 57 percent in 2017. The graphic below shows how much Americans have been saving over the years, beginning in 2014. Among those with more than $1,000 in savings, the survey results are mixed. This year, 22 percent of respondents said they have $1,000 to $9,999 compared with 18 percent in 2017. But the percentage with more than $10,000 in a savings account dropped to 21 percent from 25 percent in 2018. Perhaps it suggests that some Americans have had to raid savings to pay for emergencies or other expenses over the past year. Previous GOBankingRates surveys found that women were more frequently in a tough financial position. Women have less money saved in an emergency fund, for example. The savings survey confirmed that fact. 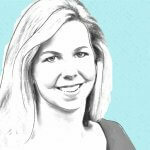 More women have less than $1,000 in savings — 62 percent of women compared to 53 percent of men. At the other end of the spectrum, a full 13 percent of men have more than $50,000 in savings, compared to just 6 percent of women. When it comes to saving, older generations could learn a thing or two from millennials. Aside from adults 65 and older, millennials have the smallest percentage of respondents with less than $1,000 saved. The survey found that 54 percent of young millennials ages 18 to 24 and 57 percent of older millennials ages 25 to 34 have less than $1,000 saved. Young millennials actually have the smallest percentage of respondents (along with adults 65 and older) with $0 saved — 26 percent. That’s a significant improvement over 2017, when 46 percent of young millennials said they had $0 saved. On the flip side, Generation Xers ages 35 to 44 appear to be having the hardest time saving money. 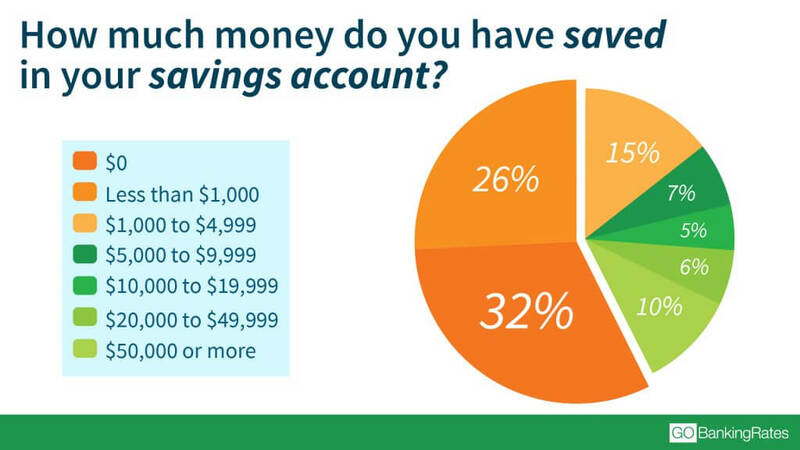 Among this age group, 37 percent have $0 in a savings account. And older Gen Xers ages 45 to 54 have the highest percentage of respondents of any age group with less than $1,000 saved — 62 percent. More Info: How Much Americans Have in Savings at Every Age — How Do You Compare? To find out why the savings rate is low, the survey asked, “What obstacle(s) are keeping you from saving more money each month?” The top response — with 31 percent choosing it — was “I’m living paycheck to paycheck.” This isn’t surprising considering that another GOBankingRates survey found that always living paycheck to paycheck is Americans’ biggest money fear after never being able to retire. TD Bank’s Love & Money survey found nearly identical results: 34 percent of respondents said living paycheck to paycheck was keeping them from meeting their financial goals. Gen Xers ages 45 to 54 and Baby Boomers ages 55 to 65 — adults who supposedly are in their prime earning years — were more likely than other age groups to claim that living paycheck to paycheck was their biggest obstacle to saving. And women were much more likely than men to say that they weren’t saving because they were living paycheck to paycheck — 35 percent versus 26 percent. The second-most-common savings obstacle respondents named was a low salary, which can go hand in hand with living paycheck to paycheck. Not surprisingly, millennials — who are just starting out in their careers — were more likely than older generations to claim that a low salary was preventing them from saving more. Among Americans who are saving, the survey found that the most common thing they are saving for is retirement. However, only 29 percent chose this response, which suggests that saving for retirement isn’t a priority for a majority of Americans. While it might not be a priority, retirement is still something people worry about paying for. According to TD Bank’s survey, retirement is one of the greatest fears couples have related to money. Fortunately, saving for retirement seems to be more of a priority for adults who are closer to retirement age. The survey found that 51 percent of adults ages 55 to 64 said that they are primarily saving for retirement. Millennials ages 18 to 24 are the least likely to be saving for retirement, with just 6 percent naming it as their primary savings goal. If you’re approaching retirement and haven’t started saving, don’t worry: Follow this do-or-die retirement plan if you have nothing saved. The second most common reason Americans are setting money aside is to save up to buy a home, followed by cars and vacations. Millennials ages 25 to 34 are much more likely than other age groups to saving for a home — 43 percent versus 27 percent overall. 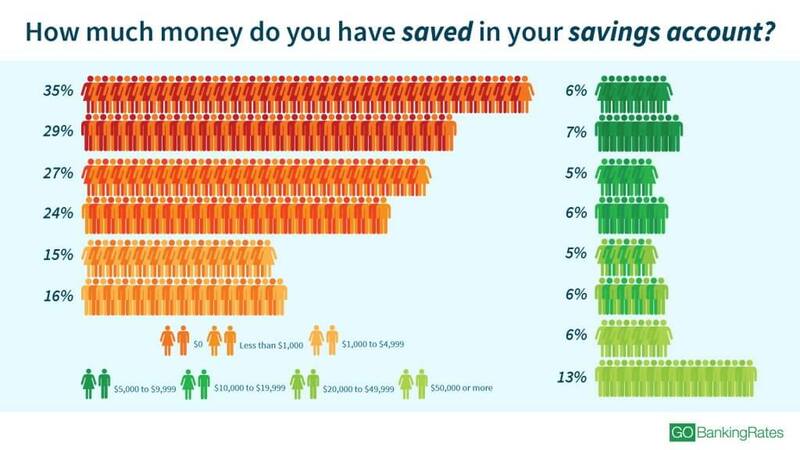 When asked who or what has been most helpful for managing savings, 42 percent of respondents said friends and family. While Thacker recommends getting advice from people you trust, he said it’s worth it to take the time to do your own research online. And don’t discount professional advice. “I always recommend talking to a financial professional like a banker or financial advisor for valuable counsel as you think through some of your own financial decisions,” he said. Thirty percent of people met with a financial advisor in the past year, the TD Bank survey found. Americans aren’t nearly as likely to seek professional help as they are to use DIY methods or rely on advice from family and friends. According to the survey, just 10 percent of adults said they use financial advisors to manage their savings. The survey found that the second-most-common thing that helps Americans save is budgeting. More than a quarter of adults say they use budgeting to reach savings goals. And another 8 percent said they use a mobile budgeting app to help manage savings. 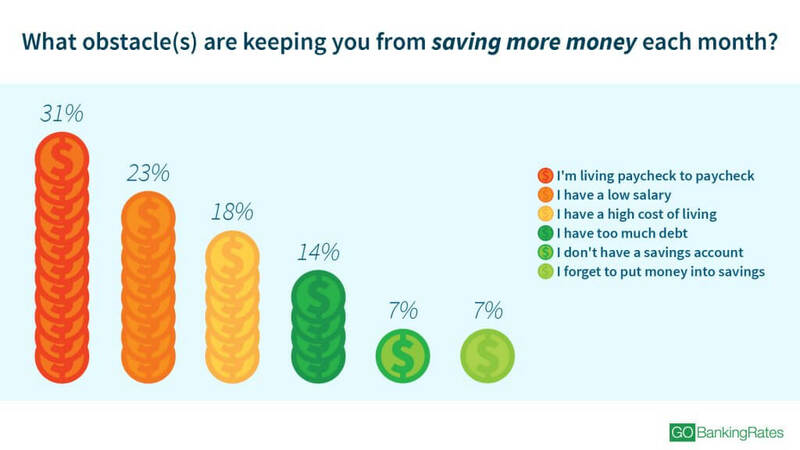 Only 7 percent of respondents said that they’re not saving more because they forget to put money in savings. Ironically, though, 29 percent of respondents said they don’t know or don’t keep track of how often they stash cash in savings. That was the most common response among respondents when asked how often they deposit money in savings. It’s not surprising that Gen Xers ages 35 to 44 were the most likely of any age group — 32 percent — to say they don’t know how often they save, considering that they have the highest percentage of respondents with no savings. It’s encouraging, though, that 23 percent of respondents said they deposit money in savings every paycheck and another 22 percent save monthly. But with nearly 1 in 3 adults not aware of how often they’re setting money aside, it’s clear that more Americans need to make saving a habit. 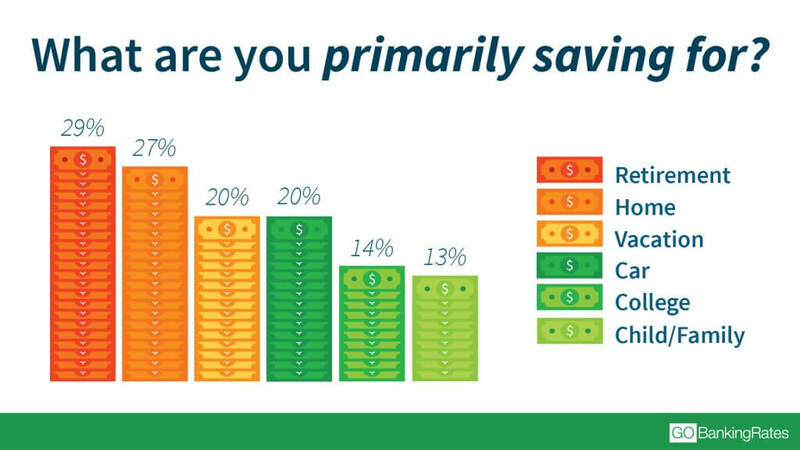 Considering that many see living paycheck to paycheck as an obstacle to saving, it’s encouraging that 37 percent of respondents said they would cut out discretionary spending to reach savings goals. And 19 percent said they would be willing to take on a second job to save more. However, only 11 percent would be willing to switch careers to achieve savings goals. An easy way to cut out discretionary spending is to make the money unavailable. You can do this by paying yourself first, which Thacker said is the most efficient way to create a saving habit. Methodology: This GOBankingRates survey asked 5,002 adults the following six questions: 1) How much money do you have saved in your savings account? 2) What are you primarily saving for? 3) What obstacle(s) are keeping you from saving more money each month? 4) Of the following, which (or who) has proven most helpful for managing your savings? 5) How often do you deposit money in your savings? 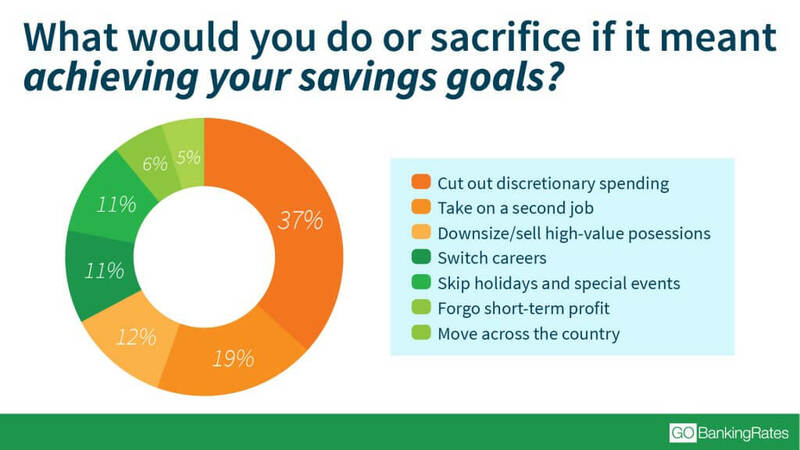 6) What would you do or sacrifice if it meant achieving your savings goals? For question No. 2, respondents could choose more than one response. Responses were collected through a Survata survey from Aug. 27, 2018, to Sept. 4, 2018, and are representative of the U.S. online population.